Online installer is also setup extractor if turbo-studio-19.1.1178.msi (217 MB) is found in its folder. Settings of installed Studio should be preserved. Great Job! Love this site so much! This version works on Windows 8 Ent.х86 ? 1 spoon creates folders: "Spoon" and "Spoon Virtual Application Studio"
2 NSIS does not back up the folder: "Spoon", creating the folder "Spoon-BackupByStudioPortable"
3 At the end are the folders on the computer, "Spoon", "Spoon Virtual Application Studio" and "Spoon-BackupByStudioPortable"
Maybe better not backing up the "Spoon"
No sense to backup only the folder "Spoon Virtual Application Studio" expecting it will backup "Spoon" folder. Need a license to use. How do I get one? You must allow launcher to write to registry (admin rights). Thank you for your update! Now work correctly! Thank you! i want create one folder app, one folder data, full registry value and one tiny .exe file to run my app...same to your app! I use NSIS to compile launchers and installers. Tanks to your reply! But NSIS isn't simple application...! And turbo studio that required an account to build your new app...? You've try?? Ok, only for other user that have same problem... click on "publish to local repository" at the end of screen program, download and install client.exe to turbo studio, after when you build your app, click on local repository and account isn't necessary! You build app on your pc! 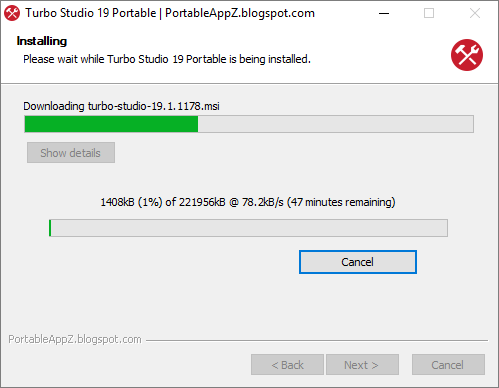 Turbo Studio updated their application to version to 17.0.886. Is there a way to update it? I have just the msi.installer but don´t have a license. Have you a public download link for the .msi? Hi Lucius, How do you install client.exe to Turbo Studio?. It is a portable application afterall. There is no options to which directory to install to. It just installs to the local machine. Is that what you did? A new version of Turbo Studio is out. 17.0.886.28. Thanks in advance if you could update the tool. Thanks. This version works fine with Windows 10 Creators Update. Publish to USB Drive feature does not work inside Turbo Studio. Files are missing. Please fix, Bernat. Is this version now Evaluation? Started for the first time and it was necessary to Login to account. If not, program grays out and shows evaluation. Just after login the evaluation has gone. Now patched by RmK-FreE (do not need a License Certificate). Downloaded again and same issue. It´s the first time I download Turbo Studio and with the first launch I get the message to sign in. If I don´t sign in to my turbo account, the program keeps grayed out and doesn´t work. And if I log into my account, when I try to change the output, it says that I must upgrade. And please tell me in which location the file is. Here are 2 images. first asking for login and second if I don´t log in. May I am the only one who get this issue? If I launch with unpatched Studio.exe I have same grayed windows as you. May be your AV block patch when running installer. You can find patch opening Turbo_Studio_Portable_18_English_Online.exe with 7-Zip and extract $TEMP\StudioPortableTemp\StudioSetup\StudioPatch.exe in StudioPortable\App\Studio and run it. Does anybody manage do capture a working version of Firefox Quantum (>= 57) with this? All of my captures are completely broken. I can't solve your problem. Perhaps remains settings of an old installed 17 version or you used a template for Turbo Studio 17. This version is "Turbo Studio 18". Sorry to bother you but do you have experience with capturing portable applications? If so could you give Firefox Quantum a try with this version of Turbo? I have been trying to capture it since January and also tried Thinapp with no success so far. Sorry I don't use virtualization to make portable: I only use NSIS compiled launchers. So Publish to USB works for you, Bernat? I did a clean install (reinstalled os) and it still doesn't work. Does it work for you? I don't use Turbo Studio but a click on Publish to USB button don't give error. You have to plug in a USB drive and click publish before it will show you the error. I can't solve a problem I can't reproduce. Bernat, you said you can't reproduce my issue, so I made you a video on how to reproduce the issue. Hopefully you will be able to fix this. Thanks. Sorry I have no *.xappl file to load and no time to test. (Open Turbo_Studio_Portable_18_English_Online.exe with 7-Zip and find StudioPatch.exe in $TEMP\StudioPortableTemp\StudioSetup). It requires me to login to use this feature? The file is patched and did not require login when I ran it. That happens when the patch fails to apply. Use instructions above to manually patch. I am talking about the Project Type - Portable Application .exe option. It works if it's standalone. However, it requires login if that option is selected. 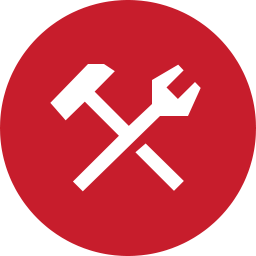 Patch used is RmK-FreE (release date: April 01, 2018). You can try with LineZer0 path using Turbo_Studio_Portable_18_English_Online_Lz0.exe but you have to patch yourself Studio.exe by drag'n drop in running Keygen.exe (in StudioPortable folder). The .msi cannot be downloaded. You need to log in with an account to download. at startup it asks for "Sign in to your account ? is there a mean to solve that ? i managed to run it without the "Sign in account request"
"(Open Turbo_Studio_Portable_18_English_Online.exe with 7-Zip and find StudioPatch.exe in $TEMP\StudioPortableTemp\StudioSetup)"
I tried "Turbo_Studio_Portable_18_English_Online_Lz0.exe" without success !!! Don't use Turbo_Studio_Portable_18_English_Online.exe for v19. You can try with LineZer0 path using Turbo_Studio_Portable_19_English_Online_Lz0.exe but you have to patch yourself Studio.exe by drag'n drop in running Keygen.exe (in StudioPortable folder). is there exist a complete checked version ? Sorry I don't use this program. if it's not indiscreet ! what program do you use to portabilize soft ?